It is a Wheel of The Year Wall resign wall plaque featuring typical representations of the Eight Pagan Sabbat festivals and was designed by Pagan artist Maxine Miller. 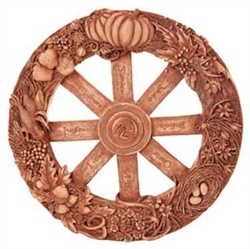 This wheel is detailed with nature items: pumpkin, acorns, nest eggs and more. A wonderful plaque to honor life, family, friends, bounty, and to welcome all. Light earth brown. Hand Painted Resin 28cm it also has multiple hanging hooks so you can turn the peice around to hightlight the current festival / time of year.